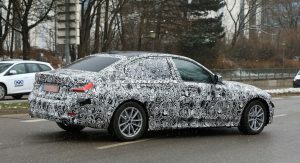 As customer preferences have shifted towards SUVs and crossovers in recent years, sales of the BMW 3-Series have been steadily declining. 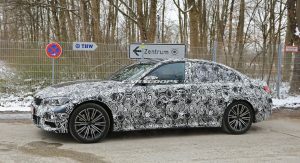 Nevertheless, the sedan remains an important staple in the brand’s luxury range and is set for a significant update to shove it in line with the latest Mercedes-Benz C-Class and Audi A4. 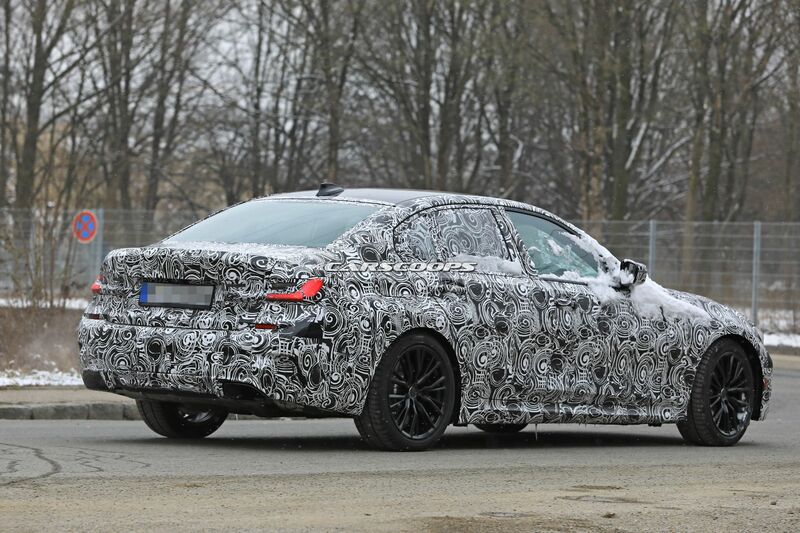 In this set of spy shots, our man with the long lens spotted not one, but three prototypes of the next 3-Series sedan, codenamed G20. 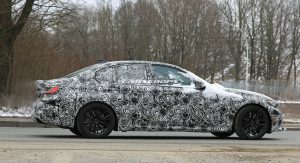 In the gallery below, you’ll find the M Sport-equipped model first, followed by the high-performance M340i that’s distinguished by beefier black wheels and brakes, and a base trim model with smaller wheels last. 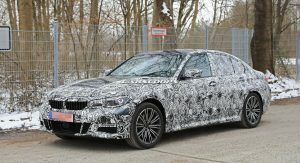 As we’ve come to expect from BMW’s Russian doll design philosophy, the latest-generation 3-Series will bear a striking resemblance to the current 5-Series. 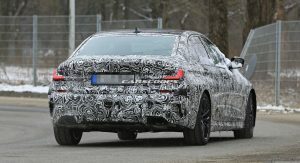 In fact, as these spy shots reveal, it will simply look like a slightly smaller 5-Series from most angles. 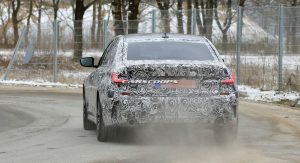 With this in mind, we can see an all-too-familiar front fascia beneath the camouflage that incorporates enlarged headlights with a new DRL design. 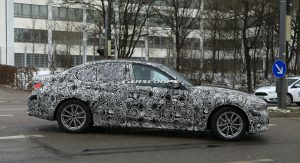 The M340i and the M Sport models get more complex front bumpers with additional (and larger) openings. The changes don’t stop here. 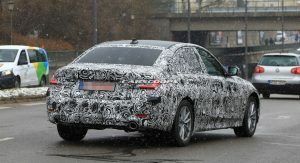 Look at the rear and you’ll notice a comprehensively modified trunk lid with a prominent lip at the rear. 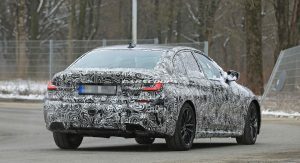 The taillights are also different to what we’re accustomed to from a 3er and our sources suggest they will adopt a different graphic set to eventually find its way into other BMW models. 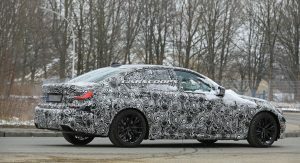 Again, the M340i (pictured above) and the M Sport models get a different bumper at the back along with re-positioned reflectors, while the M340i also stands out thanks to the M550-like exhaust trims and dark alloy wheels, as well as a more lowered suspension. 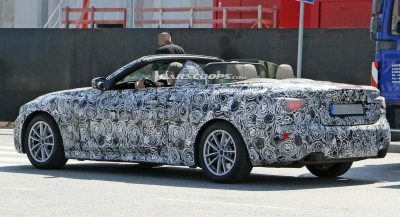 Sadly, we don’t have any images of the vehicle’s interior. 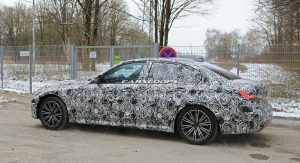 However, a digital gauge cluster like that from the 5-Series should be present but for the most part, don’t expect any evolutionary changes that make the cabin as plush as the C-Class. 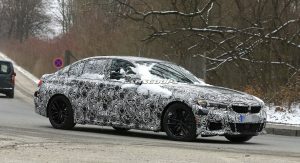 Based on BMW’s latest CLAR (cluster architecture) platform found on all their recent models, the new, lighter 3-Series will continue with 3-cylinder engines on their base offerings, albeit not in North America, where it will be sold exclusively with four- and six-cylinder units. 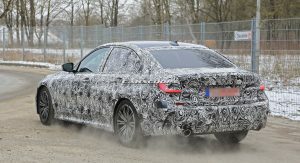 In Europe and other markets, we’ll see the entry-level petrol and diesel models (316i and 316d) sharing the group’s familiar (from other models like the 2-Series and MINIs) 1.5-liter 3-cylinder units. 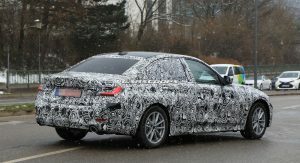 As with the current car, a wide assortment of 2.0-liter four-cylinder gasoline and diesel units will account for the bulk of sales for the 3-Series, delivering up to around 260 horses. 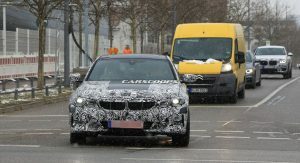 We’ll also see at least two plug-in hybrid models, based on the 1.5-liter and 2.0-liter engines. 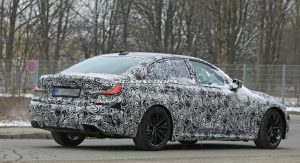 BMW’s M Performance arm will develop two models, the Mercedes-AMG C43-competing M340i (available with xDrive too – though, we don’t know at this point which version will come to the States) with a 360hp 3.0-liter turbocharged inline-six gasoline engine, and the M340d xDrive, set to get a 320 horsepower 3.0-liter twin-charged straight-six diesel. 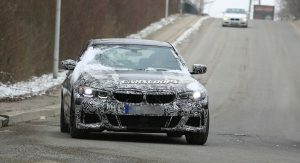 A purebred M3 model with a 500hp straight-six featuring water injection will top the range. 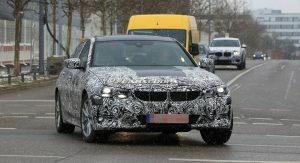 The overhauled BMW 3-Series should be revealed before the year is out. Hey, look! 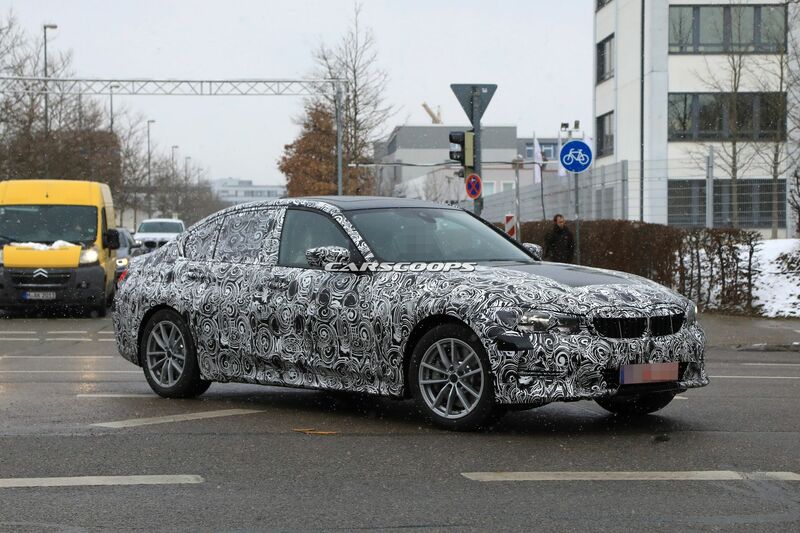 A BMW…that looks the same as all BMWs. 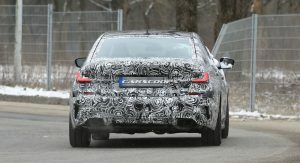 Look is not much to be excited about but I hope they make it a proper driver’s car! Agreed. Good luck. 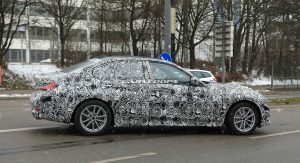 These are not real BMWs and I bet engineers and designers aren’t happy either. They left F1 and now work with Toyota. Sad affair… But they have models 1-10 in x model as well!!! Lol. Idiots. I’m sure the money looks good now but it’ll hurt once their sales fall further and the reputation they worked hard to earn is tarnished… Can’t get that back easily. Like maybe never. Who is the CEO? What a money whore with no vision or self respect… Or respect for the rondel. Despise that person. 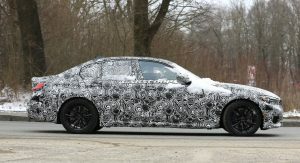 The iPerformance version is certainly going to be my next car. Really!?! Find a new manufacturer compadre. 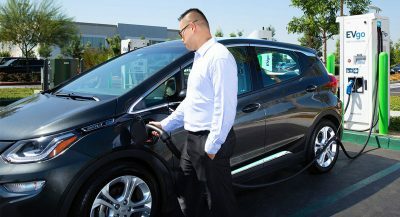 Perhaps Lexus or Tesla for you. 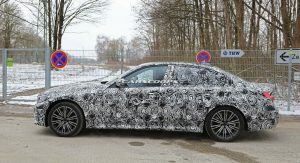 Nah, Lexus design is just tacky to me, and while Teslas are very impressive, they are way too expensive, besides the current 330e gets 50 kilometers of electric range, assuming the next one is getting at least that, i could do my daily commute on just electricity and then have the ICE for the weekend. 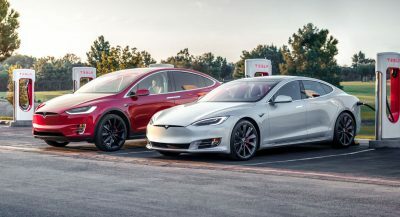 Won’t look revolutionary, will outsell everything else it competes against. 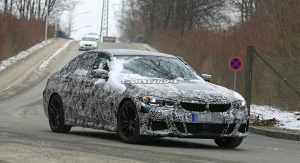 Again BMW seems to fight themselves. Since bangle the designs are continui and boring and cater to moms and grandmoms. Nothing good since e46 and the sweet bangle designs after that. 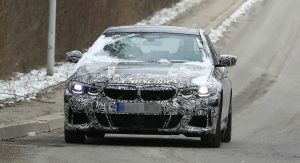 Besides that, electio steering etc has completely gotten away from what made everyone want a bmw. 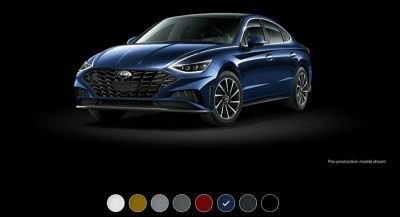 Fire the execs because they are leading the company to a decline… Only cashing in on the reputation at this point. I’m not sure my next car will have the rondel. Pretty sure it won’t since this is the next five years. Lame. Sad. Germany should be ashamed. These are all right lane cars. Germans know what I’m talking about. 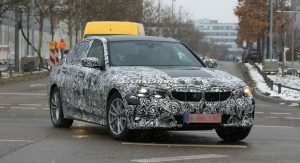 Like all current BMW’s, already looks soooooo boring BUT, competent (and likely unreliable). 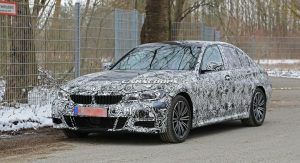 not a big changes like e90 to f30! They screwed up when the 3 was made larger. 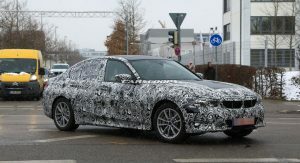 The 11 was the last true 3 series sedan. It still looks better!